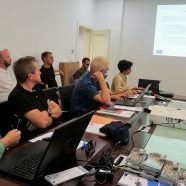 The EGS Marine Geology Expert Group (MGEG) had its annual meeting back-to-back with the 4th EMODnet project meeting in Shengjin, Albania on 24th September. Altogether 19-member organizations were present at the meeting. Additionally the meeting was attended by Jennifer Valerius (BSH, Germany) and Valerii Rokitshkij (Ukranian PSRGE), who gave their presentations on national marine geological issues. Most of the meeting was spent on national reports, but we also discussed GeoERA and its marine parts and amongst other issues possible staff exchange and equipment inventories. The EMODnet project had its 4th project meeting in Shengjin Albania the last week in September. During the meeting the 75 participating delegates from 29 European countries decided upon activities to finalize the project according to set tender by April 2019. During the last six months of the project partners will deliver last updates on data and the work package leaders will update EMODnet Geology data products, such as the seabed substrate, sediment accumulation, bedrock stratigraphy and lithology, coastal behavior, geological events and susceptibility, and marine mineral maps into scale 1:100,000 or the best available scale. Additionally some new features will be released for the first time, such as; geomorphology, Quaternary geology, and submerged landscapes of the European continental shelves during various postglacial time slices.